It's a beautiful May, 2011, afternoon in Edinburgh Park, Scotland. 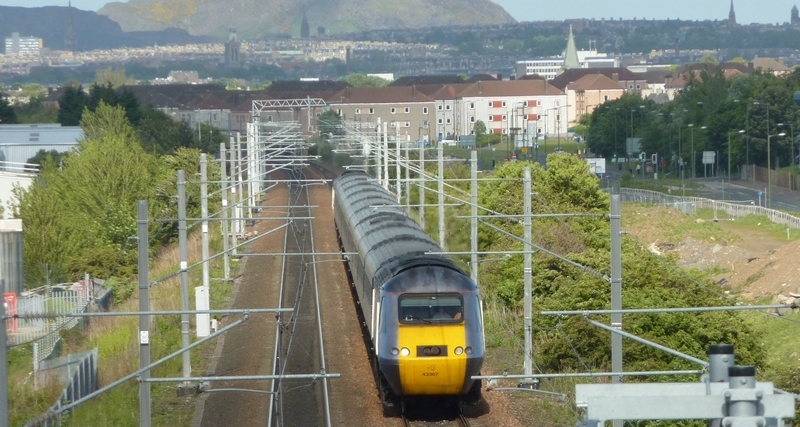 Here's a venerable HST 125 train on its way from London and Edinburgh (in background) Waverly to, in all likelihood, Aberdeen. We've commented before on the robust expansion of rail service in the UK, where even the Tories support new high speed rail projects, as opposed to the rather dimwitted approach taken here by their conservative counterparts who have killed a much needed Hudson River tunnel (with cooked data?) and another popular (and job producing) project in Florida. This is not to speak of other expansion efforts in the Midwest. The day of this trip my friend Tim Wright and I rode the rails over to Glasgow and Helensburgh, noting many new trains, stations and services. Back to the photo archive. Here's a mid-1960s photo of the Reading Company's Crusader, photographed in West Trenton, NJ. If my memory serves me correctly the train would be on its way from Jersey City to Reading Terminal in Philadelphia on Central Railroad of NJ tracks, having stopped in Elizabeth, and Belle Mead, with further stops to come in Jenkintown and Wayne Junction. Its partner train, the Wall Street, which also had a cafe car, also enjoyed a dedicated and enthusiastic following. A year or so before this photo was taken the streamlined cars used by the Crusader were sold to a Canadian Company (probably the Canadian Pacific, which ran streamliners) and it came to share the flat sided equipment of the Wall Street. Various changes in track conditions, ownership and schedule soon saw a rapid deterioration in service on this line, which ended in 1982. Fortunately, I was able to get this one shot for my collection and your enjoyment. The camera was probably my first single lens reflex, a Nikon Nikkormat. Hurricane Sandy put out the lights in much of New York and New Jersey, where there has been enormous human suffering and physical damage. There have been gas lines that are miles in length and most public transit has been closed down. As I write this Jersey Transit is beginning to restore limited service on some lines to Newark, awaiting NE Corridor connecting trains into Manhattan once Amtrak has opened at least one of his tunnel (hmmmm, would be very much a relief to know more access, which Governor Christie killed, would be coming soon). 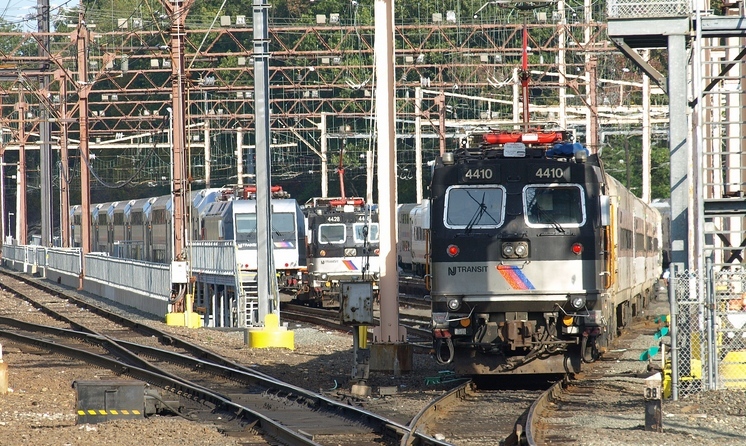 One of the lines not yet open is the Morris-Essex line which runs from Hackettstown-Dover down through Morristown to Hoboken, with some trains running over the Montclair-Boonton Line to Hoboken. When I visited the Dover station and photographed the nearby yards in October, lines of colorful and gleaming trains met my camera and me in a town where I spent a year in high school. 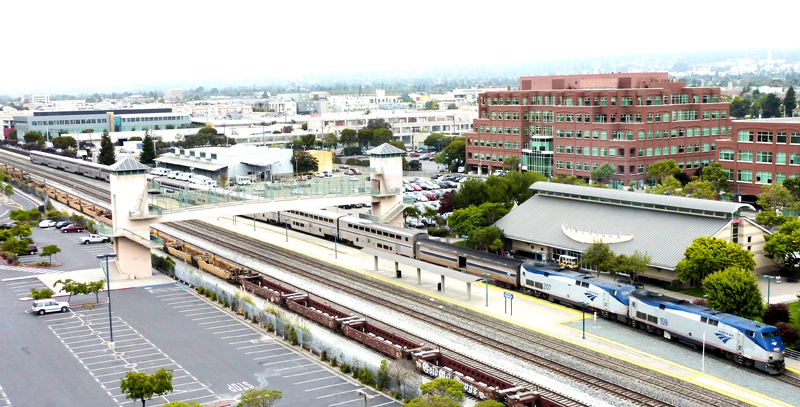 Hopefully they will soon be back in service and adding some color and energy to what will doubtless be a bleak landscape for weeks or months to come. Lets all think about storm victims and the many public servants, transit employees and volunteers who are working to help them. Lets also hope that one of Sandy's lessons will be the need for better infrastructure. Changes last made on: November 2, 2012.